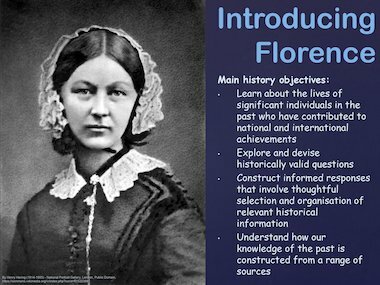 A ready-made KS1 lesson with teachers’ notes that focuses on the the life and work of Florence Nightingale. This is a Microsoft PowerPoint file. They can be created and read using Microsoft PowerPoint or the PowerPoint Viewer 2007 program. PowerPoint 2007 Viewer is available free of charge from Microsoft and can be downloaded from the Microsoft website.